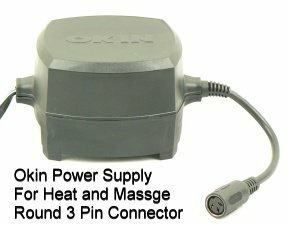 Okin Power Supply Cable With 3 pin to 2 prong connections. This part is no longer available. It was mostly used on La Z Boy's on simple up and down chairs without heat and massage. 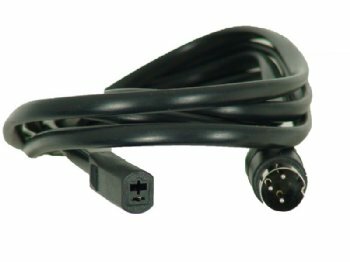 The replacement at this link will give you a workaround that includes a new power supply with two prong connectors on both ends instead on one 3 prong, for $77.60. This old unavailable cable connects power supplies with round 3 pin female connectors to Okin Deltadrive and Betadrive Motors. The unavailable cable plugs into this type of power supply. Please include your Okin 11 digit part number in the comment box. You have 25 characters left. Do not use HTML. Please include your Okin 11 digit part number in the comment box. You have 25 characters left. Do not use HTML.